I've known a couple of former Los Angeles residents who would like nothing more than to see the City of Angels go up in a cloud of smoke. Even though director Chris Gorak attempts to grant their wish in Right At Your Door, it is doubtful that the Hollywood haters will derive much pleasure from the experience. There are no "shock and awe" pyrotechnic displays. There are no state-of-the-art CGI nuclear explosions, or earthquakes which send Tinseltown to the bottom of the sea. Instead, this film chooses to do something much more disturbing: it concentrates on the psychological effects of living at ground zero, on the day the "terror meter" decides to go red. Brad (Rory Cochrane), an unemployed musician, is going about his normal morning routine when he hears an emergency report that there are explosions going off all over the city. The good news is that Brad is safe and sound at home. The bad news is that his wife, Lexi (Mary McCormack), is not. Brad calls Lexi over and over, but cannot get through. Now thoroughly freaked out, Brad rushes out to search for his wife. He does not get very far - police have cordoned off the area, shooting and killing a barricade jumper to show that they mean business. If that were not enough, the spotty news reports begin to inform the public that the explosions are believed to be those "dirty bombs" that we've all heard so much about. So Brad does exactly what he has been told to do, goes into a hardware store and grabs as much plastic sheeting and duct tape as he can get his hands on, and sets about the task of hermetically sealing his suburban home. Assisting him in this job is a handyman (Tony Perez) who has taken refuge in the house. The two men finish their work, and are left with nothing else to do except listen to the bits and pieces of information coming in over the radio, and pray that their wives are alright. Everyone who has been exposed to the bio-chemical in the bomb is as good as dead, the news says, and they should not be allowed to come into contact with those who have obediently Saran-wrapped themselves indoors. Brad's hysteria has settled down into a grim acceptance of the fact that his wife is never coming back. The handyman leaves the following morning, saying that he doesn't care if he lives or dies, he will not be apart from his wife. Now Brad is alone, mourning for the wife he believes that he has lost. To his shock, a dirty and exhausted Lexi begins pounding at the front door. Brad is elated - until he realizes that his wife cannot come inside, or else he'll get the mysterious infection that the news has warned about. Does he let her in and risk being infected? Or does he try to save himself and let his wife die alone? Gorak needs to be commended for managing to tell a story about terrorism without trying to infuse the proceedings with any political grandstanding. The questions the film raises are more universal, and not necessarily specific to any particular situation or ideology. Who do you trust with your well-being? The people that you know and love? Or the people who claim to know best? And do the authorities exist to protect the people, or to protect themselves from the people? 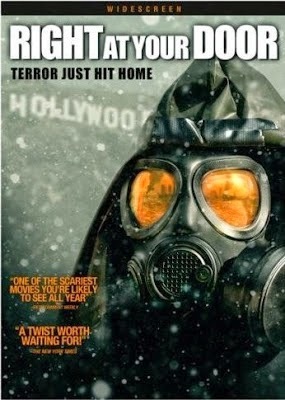 Of course, there is no question that this is very much a "post 9/11" themed film, but instead of name calling or thinly-veiled references to real people or institutions, we get a movie about people who happen to be living through a nightmare. Who orchestrated the attacks is of no consequence to the film, only the actions these characters must take in order to survive. In this film, like George Romero's similarly-themed The Crazies, the people who claim to know best are armed to the teeth and carrying some nasty looking guns, patrolling the streets and interrogating the survivors. Meanwhile, Lexi has no weapons to intimidate Brad with, she can only hope that he loves her enough to risk dying by her side. She tries to convince Brad that the authorities are lying, and that Brad is foolish to listen to them. We come to find out that Lexi may not exactly have been a saint in the past, hence Brad's reluctance to potentially commit suicide. They are flawed people in a cracked relationship, and instead of working out their problems on a therapist's couch they are forced to do so in the worst possible circumstances. Divorce is not an option, one of them has to die. It is compelling material that nearly becomes redundant, as the two endlessly argue the same points. Cochrane and McCormack are both very good in their roles, carrying the film even when the material begins to run low. The couple must lie in the bed that they have made when we get to the gut-punch finale; an ending that would have made Rod Serling proud. The first twenty minutes of Right At Your Door is nearly perfect; so good that I could overlook the fact that the film runs a bit too long and that a plot device in the form of a little boy named "Timmy" feels completely artificial. Gorak succeeds in creating a thought-provoking, relentlessly bleak thriller that will stay in your mind for a long time after the film ends. Filmmaker Michael Feifer specializes in fast, cheap, direct-to-video snoozers that feature slick cover art designed to make you think that the movie you are holding is much better than it actually is. 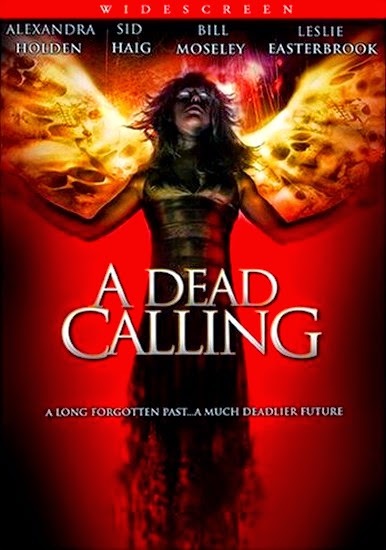 A Dead Calling only differs from the rest of his work in that it is a supernatural thriller rather than an inaccurate serial killer movie or a skin flick. The movie, about a reporter who investigates an old murder and finds herself being stalked by the killer is part ghost story, part serial killer movie, and all boring. Lots of weak performances, awful dialogue, and a complete lack of frightening or even interesting moments sink the film long before it kicks into full-blown "Lifetime Original Movie" territory in the final act. The only thing notable about the film is that it features a mini-reunion of Bill Moseley, Sid Haig, and Leslie Easterbrook, all of whom appeared together in Rob Zombie's serial killer/road movie, THE DEVIL'S REJECTS. The three actors play against type: Moseley is a cop who is only in a couple of scenes and is killed off before the halfway point; Easterbrook and Haig are the reporter's loving parents, and get some of the film's sappiest dialogue. In true exploitation style, all three are featured prominently in the advertising and the disc art for this movie, even though they are cast in small roles that could have easily have performed by anyone else. A clever bit of casting to help liberate dollars from the pockets of Rob Zombie fan boys.